Visiting La Rioja for wine tourism is an incredible experience. You can’t possibly understand the famous Rioja wine region without seeing it for yourself — the tiny plots of vines, the dozens of centuries-old family-run wineries, the amazing modern architecture, the golden-hued leaves in fall. The best way to see if for yourself is to check out a few of the must-visit bodegas in Rioja. There are hundreds of bodegas in Rioja to visit and they are spread out over three principle zones – Alavesa, Alta and Baja. The area is so large, you would have to play darts with a Rioja wine map to decide where to go. We’ve done some of the work for you and offer up this list of the wineries where we found the best Rioja wine, because when it comes down to it, it’s all about the wine! This is no where near a comprehensive list, but if you’re doing your own planning, it’s a great place to start. Remember that you must book a wine tasting tour at least 2 days in advance (more is better). Most bodega websites have information in English on how to book, either by email, phone, or online form. We suggest email if you’re doing it yourself. We never get much response from submitting the form online. You also need to be flexible if you want an English tour, because they aren’t always offered. Tours range in price from €5-€20 and include a tasting of 2-4 generous pours of wine. You can easily visit two wineries in a day, plus lunch. Three would be pushing it, but if you plan it right, it can be done. If you want to lay out the best path, put all of these bodegas into Google Maps so you can see where they are before you start planning them out. Always make sure you’re traveling responsibly between wineries. Choose a designated driver, or sip and spit — but also make sure you’re properly refueling between stops. There are a bunch of bodegas that serve wine lunches (see below for details), but one of our favorite things to do in the area is a pinchos crawl in Logrono, which can be done during lunch from 1-3pm. If you need some tasty ideas, here’s a list of the top foods to eat in Spain. Keep reading below for more information on how to get to the Rioja wine region and where to stay. PRO TIP: If you don’t want to plan out your own wine tasting tour in La Rioja, you can leave it up to the pros and book a pre-arranged tour. Located in the town of Haro, Muga offers many experiences from hot-air balloon rides, to private tours and wine classes. The modern building has a great wine store where you can buy gifts and wine and enjoy a tasting flight at the bar. They offer daily tours, but you don’t have to take a tour to try the wine, which is great if you want to make it to some other wineries in Haro in one day. Muga is close walking distance to the other Haro bodegas mentioned here, so you can easily park your car and walk between them. One of the oldest wineries in Haro, Lopez de Heredia now features an interesting juxtaposition of the old and new winery experience. You can tour through the old part of the winery, which has been receiving visitors since 1886, then taste the wines in the space-age looking room built by Zaha Hadid (that`s the decanter shaped building on the left). The winery is located just 100 steps up the hill from Muga and you can also taste wines here without a tour. Again, just another 100 steps up the hill is Roda, another of the old wineries of Haro. The modern tasting room here leads down into the underground cellar that is built into the hillside. If you go just for tasting, you can take your glass down into the opening of the cellar for a view (it`s closed off by a fence, so you can`t actually go in – just peek through), otherwise you can see the underground cellars on a full tour. Roda specializes in Tempranillo. They also sell a plate of Jamon Iberico to go along with the tasting. Located in the small town of Briones, Dinastia Vivanco is a complete wine tourism destination. There is a bodega and plenty of wine, but there’s also a restaurant and a wine museum. And you won’t want to miss any of them. If you have enough time, you can book a tour for 11am, lunch at 12:30 and then spend a couple hours in the museum afterward, but you don’t have to do all three. We skipped the tour and chose to enjoy a wine-tasting lunch, followed by the museum. There is an audio guide that narrates the journey through the museum that is highly recommended. Check out the options for lunch. This is one of the only wine pairing lunches in the area. Architecturally, Bodegas Ysios is one of the most stunning winery buildings I’ve ever seen. It was designed by renowned architect Santiago Calatrava, as a symbol of the new Rioja. It’s meant to mimic the rolling Sierra de Cantabria mountain range behind it. Visiting Ysios includes a walk through the modern interior of the building, into the beautiful and sprawling modern cellar, along with a tasting of three of their wines in the upstairs tasting room. From upstairs, you can look out the windows at the mountains. Even if you don`t stop here for wine tasting, I highly recommend stopping for pictures. You do need an appointment to visit this winery. Located just outside the old town of Laguardia, Eguren Ugarte is a family-owned winery that was built with passion and dedication by Victorino Eguren Ugarte, and is carried on by the next generation. The tour of the winery is absolutely fascinating and cannot be missed. You’ll wonder through what seem like ancient underground caves where patrons of the winery can keep their personal stash of wine and stop by to enjoy it in the cellar. Believe me, you`ll be wishing you had your own private wine locker. It`s really awesome in there. If you don`t want to do a full tour, you can stop by for a tasting only. You can also reserve a lunch or dinner in their restaurant. Located just outside of Laguardia, Viña Real is part of a larger brand, Cvne, founded in 1920 to promote Rioja wines. The winery, designed by Bordeaux-based architect Phillipe Mazieras, is located atop the Cerra de la Mesa, with a fantastic view of the valley below. It’s a great representation of the Alavesa wineries, which are really starting to embrace modern architecture and gravity-based production. 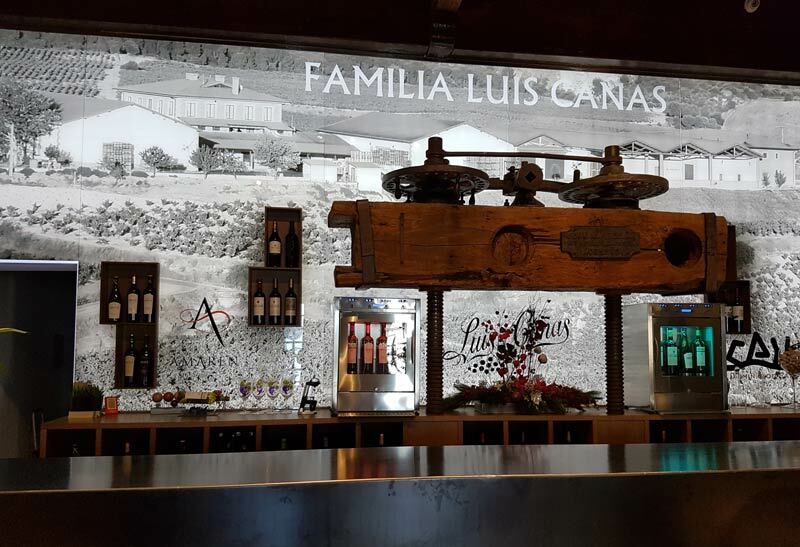 Luis Cañas, located in the small town of Villabuena de Alava, is a family-run bodega that dates back to 1928. They own many acres of their own estate grapes, which leads to the specialized cultivation of their best wines. It is among the top wineries in Rioja Alavesa and has won many International awards. It’s distributed widely in Spain and other countries, as well, so it may be easier to find than other smaller-production wines when you return home. Tours are given daily with prior appointment. On a side note, Luis Canas is located very close to our top recommended hotel: Hotel Viura. If you`re looking for a really great place to stay with a wine theme and very nice, modern rooms, definitely check it out. Another architecturally stunning bodega to visit is Marques de Riscal. The Luxury Collection hotel on the property in Elciego was designed by world-renown architect and is definitely the place to stay for a luxury experience. The winery was founded in 1858 produces more than 3 million bottles of red wine per year, making it one of the oldest and one of the largest wineries in Rioja. It can be overrun with tourists, but it’s still worth it to take the tour of the old underground facility and see the hotel up close. There’s also a Michelin-star restaurant on site. Located in Samaniego, Ostatu was founded in the 1960s and has been family run and operated ever since. The winery building is attached to a mansion that was once used as an Inn, and will once again in the near future (we would definitely recommend staying there, if possible). Visiting Ostatu includes a tour of the production facility and an introduction to three of the bodega’s popular wines along with an appetizer. Be sure to make an appointment in advance. This is isn’t generally a place you can just walk in for a tasting. Across the street from Ostatu is the towering glass facade of Baigorri, designed by architect Inaki Azpiazu, that stretches 7-stories underground. The facility was designed for vertical, gravity-based wine making and you can view the entire process from one floor — the floors are all open in the center so you can see each tier of the process. They also have an impressive barrel room. La Rioja is located in the northern part of Spain, about 4 hours north of Madrid. The closest airport to La Rioja is in Bilbao, which is located at the north end of the Rioja valley. From there, it’s easy to get around to all parts of the valley via car. A great place to start your wine journey in Rioja is in Haro, where the historic wine houses are located. Continuing east will take you into Laguardia, a small, but charming walled town, and then to Logrono, the capitol city of the region. If you fly into Madrid and rent a car, the journey will take you through another well-known wine region, the Ribera del Duero, which is one of our favorite wines to drink. After a stop off there to try the wines, it’s just another short jaunt up the freeway to the beginning of the Rioja wine valley. Don’t be worried about driving in this area. Roads are well maintained and marked and there’s often little to no traffic. Of course, you’ll have to designate a driver who won’t be drinking. Plenty of tour companies run tours through the area, so if you’re not into driving and scheduling visits yourself, you can easily get hooked up with a tour company and do it the easy way. Touring around the wineries in the La Rioja wine region of Spain is one of our absolutely favorite things. It’s one of the only places we’ve been back to, specifically because we loved it so much. If you love Spanish wine, you should also check out the Ribera del Duero wine region, about 2 hours south of Rioja. Amazing wines there! La Rioja is one of our favorite wine regions to visit. The views of the vineyards is unlike anywhere else and the wine has a delicious way of tempting you to have just one more glass. We can’t get enough of it. Have you been there? What are your favorite bodegas in the Rioja wine region? This entry was posted in Wine and tagged Rioja, Spain, wineries. Hi Nick and Laura-Just back from our northern spain trip. I based our 1.5 day trip around La rioja on your article. I think it sums up the Bodegas beautifully. We ended up visiting Luis Canas and the must Marques de Riscal. On our second tour I understood that we covered the basics with these 2. Tried to book dinner at Baigorri but I guess I was a bit late for that so we skipped it. The person I exchanged emails with recommended us Hector Oribe’s restaurant. that was also so good. Also as we travelled with our 10 yr old this was the maximum we could do. Hi Lale – I’m so glad you came back to let us know that you’d done this trip! How exciting. Don’t you just love that area? We were hoping to go to Echaurren last time we were there for dinner, but didn’t make it. We’ll be going back in November, so I’ll definitely book it this time. So glad you had a great time on your trip and enjoyed these wineries! I am travelling through Logrono as part of Camino and would like to do a wine tour in Logrono . What do you think of the wine tours that are advertised on trip advisor I thought they seemed rather expensive. I enjoyed reading your articles and definately will do the pinchos crawl!!! Hi Mary! Definitely do the pinchos crawl. You can try so many of the wines on the crawl in small portions. If you have a car, I recommend doing your own tour, because as you say, guided tours are expensive, and it’s really easy to do yourself. There are a few wineries in Logrono that I recommend going to: Marques de Murrieta, Franco Espanolas, Campo Viejo and Vina Real. You can arrange visits through email, or have a hotel concierge set it up. Even if you don’t have a car, you can get to these easily by taxi. Have fun! Let me know if you need any more info. Hi Laura, a lot of these wineries look very modern. Which one would you recommend for a more old world, authentic feel? Thanks! Hi Daniela, Some of them are modern, but many of them aren’t. Lopez de Heredia is quite old and has a fantastic cellar tour that showcases it. So does CVNE, and Roda, down the street. Eguren Ugarte is new, but their cellars are very impressive. Marques de Riscal has a new, modern facility, but they still show you around their very old cellars too. I want to thank you for this forum of information. I took it with me to my wonderful 2 day stay at the Eguren Ugarte hotel. We visited Ostatu, Bai Gorri, Dinastia Vivianco, Marques De Riscal, Ysios, Luis Canas, & the city of Longrono. Let me tell you that the best advice of all was visiting Bai Gorri for lunch. Its a 3 course meal with 3 wines to taste and totally worth it. You should call ahead if you want to just eat lunch. It wasn’t hard to get in, we were 1 of 4 other couples eating lunch on a Thursday. I would say I’m semi experienced within different wine varieties and encourage my fellow wine enthusiasts to save Ysios, Vivianco & Marques De Riscal for the end, as locations to admire for well put together bodegas (wineries). I found the best tasting wines at Ostatu, Bai Gorri & Luis Canas. Ostatu has your whites and reds that are amazing indescribable, we did a tasting of the Singular wines. Your full bodied reds that are worth the tasting flight were found at Luis Canas and BaiGorri. I can not wait to go back and try the other bodegas on this list. Although we were staying at Eguren we didn’t do a tasting due to the limited time we were there, we were never at the hotel. I would recommend staying at this hotel since its close to a lot of bodegas on this list, and the views are something out of a fairy tale dream. You can even walk through the vineyards at Eguren, I did a jog one morning through them and was in paradise. Cheers friends! Saludos! We’re traveling between Madrid and Bilbao in late February this year and have 2 days. We were planning on one day in Segovia and one in Rioja. Is another day in Rioja worth skipping Segovia given the time of year? Hi Erin. I haven’t been to Segovia, so I might be a bit biased, but I would spend both days in Rioja, especially if you like wine. If you only spend one day, you’ll just wish you’d done 2. It’s a really awesome place. We are planning a trip to Rioja in October. I understand it can be difficult to tour/taste because of harvest. Do you know any wineries that have special events to join for harvest? Is there an expectation to purchase if you tour? At smaller family owned wineries? I don’t know specifically which wineries offer events during harvest. I would recommend emailing the Rioja tourism board. They will know everything you need, and will be up to date and helpful. Laura, we will be in Rioja 3 days early June. Your blog has excellent recommendations, look forward to visit the wineries you recommend. We are staying in Logroño and pincho bars at Laurel St is on top of our list. Keep up the quality information you present. That’s so exciting, Lourdes. I crave the pinchos bars – make sure you stop at Bar Jubera for patatas bravas! Yum. Thank you so much for this Laura! This has been super helpful! I am planning a hen-do which will be slightly different…. The bride loves cycling, and we were thinking of doing a wine tasting cycling weekend. There will probably be about 15 of us – do you have any recommendations on where a group can stay, and if there are any must do activities outside of wine tasting? I was thinking of the hot-air ballooning possibly? Carla, I think a cycling trip in Rioja would be fantastic. For hot air balloon rides, check out Muga https://www.bodegasmuga.com/en/wine-tourism/activities/hot-air-balloon-ride/. Definitely visit Logrono for the pinchos crawl (we have a post about it). For other activities, there are a lot of great little towns, impressive cathedrals, nature reserves, even a piece of the Camino de Santiago. You won’t run out of things to do. Eguren Ugarte has rooms, not sure if enough for 15. Otherwise try to look for a holiday home. I’m sure there are plenty in the area. Hello I really enjoyed your article. I / we are staying at a nearby Parador …Parador de Santo de la Calzada, arriving early Tuesday June 19th (with a family – 19 and 16 year old), for only one night! I can spend the day on the 20th, just have to drive to Madrid that evening, after some time “not tasting” for a safe drive. I would appreciate your recommendation on how to spend our time at which of the venues (or others) you feel are ideal…thanks! Hi Mark – I think you’d enjoy the town of Laguardia. It’s a fun place to walk around, there are restaurants, wineries, bars. Try to get an appt at La Fabulista (it’s a very old winery with underground caves), and maybe also try nearby Ysios and Egaren Ugarte, or Baigorri (they have a fantastic lunch too). Enjoy! Hello, We are driving from Madrid to Pamplona and want to stop in Rioja for some wine tasting. The problem is, we cannot leave Madrid until 2:00pm on a Friday. Will there be any wineries still open when we get to Rioja? Hi Catherine – There are a few wineries in Haro that are open late-ish, like 6pm or 7pm. Try Lopez de Heredia, Gomez Cruzado, Ramon Bilbao, and CVNE. Hello. having just passed my WSET level 3 exam I keen to plan a special Rioja trip for my 60th in 2020. On a previous visit we went to Marques de Riscal. I would now like to visit as many bodegas as possible over 4 or 5 days with good meals too! Would welcome your advice and recommendations. Other bodegas I am interested in are Roda, Tondonia & Muga and especially Castillo Ygay. Any hotel recommendations, restaurants please? Tony,we just passed level 2 wset. Congrats on level 3! You’ll love Rioja! Have you read our articles on wine tasting in rioja and Haro? Lots more recommendations there. For hotel, we love Hotel Viura, and hotel plaza mayor in Logrono. Also love the pinchos crawl in Logrono. Thanks for reply. Congrats on Level 2. If you plan to do level 3 it is a step change with more emphasis on applying your knowledge. Hard work, enjoyed it and recommend. Will defer Diploma for 2 years and enjoy life first! Hence Rioja trip. Will use your excellent Rioja summary in my planning. I have Hotel Viura on my radar – which bodegas are nearest. Emailed them and they say taxis are expensive with both Haro and Logrono 30Km away so recommend we use our hire car. I am thinking of adding bodega Vivanco to my list. I like the look of all 11 bodegas you mention so may to rethink my route and days. Have you been to Castillo Ygay? Just looking for a hotel that is well suited. Thanks for sharing. You won’t regret Hotel Viura. We love it. Right next to Bodegas Luis Cana which you absolutely should have on the list. Also near Ostatu and Baigorri. Nice article! I am visiting on a Sunday with my wife and 6-year old son. Which wineries are open on Sundays? Which ones admit young children (at least in parts of the house)? In case they are not allowed, are there any activities that are suitable for young children in Haro, Logrono or Laguardia while adults tour the cellar? Thanks! David, you won’t have any trouble bringing the kids with you to the wineries. They all allow children along on the tours. Most wineries are also open on Sundays from 10am – 4pm. It’s always wise to check the website of the ones you want to visit and make appointments in advance. If you haven’t seen our guide on wine tasting in Haro, do take a look at it. We will be visiting Legrono for 2 nights in July. I’ve done a fair bit of research and I have to say your article is by far the most helpful I have found. Thank you. I will be taking my mom with me who has some mobility issues. She can walk but has trouble with stairs, and for longer distances she’ll use a wheelchair. Which wineries would you suggest for someone with mobility issues? I’m interested in visiting a modern winery as well as a more traditional one. Hi Rosa. Thanks for the compliment about our post. The modern wineries are more likely to be wheelchair accessible. The only one I know for sure is Baigorri. I would suggest emailing the more modern facilities first, like Ysios, Marques de Riscal, Luis Canas. Hello Laura, great information here! We’re staying in Haro in early August and have a tour reserved for Muga, sadly our other favorite (Lan) is closed for the holidays… We’d like to stop into Roda , Lopez del Heredia, and others for tastings and not tours (we’re traveling with teenagers). Can we stop into these and some of the others you’ve listed (and just in general), just for tasting, without set times and reservations? I see you can at Roda (you mention bringing a glass into the cellar), but is that standard? We’re super excited, love the article – thank you! Hi Baron. You won`t have any trouble walking in for a tasting at any of the wineries you mentioned without an appointment. They all have tasting counters with flights to choose from. Others we recommend are CVNE and Gomez Cruzado (one of our favorites). The wineries outside of Haro are much more likely to require appointments. Hello! We are headed to Rioja on the 18th. I am making our reservations now. I was wondering if you could choose lunch at one these wineries, which would you choose? And if you could choose two, which would you choose? Thank you very much!!!! Feel free to email me also! Shivani, I would choose Baigorri and Eguren Ugarte in that order. Baigorri’s lunch is really hard to beat. I LOVE this blog! Question: are any Bodegas open on Sunday? We will be in La Rioja August 31-sept 4. We have also heard the Last Saturday of the month all the wineries are open in abalos with free tastings? Any thoughts or ideas of the best wineries in abalos? So happy that you love the blog, Leslie! A lot of the bodegas are open on Sunday. If you check back through the comments, you’ll see some recommendations for Sunday wineries. There are quite a few wineries in Abalos, but I haven’t personally been to any of them. I’m planning a trip to Rioja in May and I cannot wait to try out your recommendations! I’m going with my elderly parents for 6 days and was wondering if you thought that may be too much time in Rioja. Additionally, they don’t feel comfortable driving and nor do I. Do any of the winery tour companies offer private guides and transportation for 4-5 days? Or do you have any recommendations in terms of transportation? Victoria, 6 days wouldn’t be too long if you take it slow and see all the sights in the area, including wineries. There are many opportunities for long lunches too. If you like to have a full schedule, then 3 days would be enough. For driving, there are some comoanies that can drive you for 3 or 4 days. However it will be quite expensive. It’s really quite easy driving there. Great roads, not a lot of traffic, good signage. Gary, if you really don’t want to hire a van for everyone, I would think ordering 2 taxis would be the best option. The taxi company might have a van everyone could fit in, if you order it in advance. Feel free to email me, Lynn. I haven’t had lunch at Murrieta, though it is one of my favorite wineries. I think Baigorri has a rather unique and unbeatable lunch.